I'm building a Ryca Cafe Racer in a single car garage. That garage space is shared with two other motorcycles, several bicycles, assorted horse gear and remnants from previously owned vehicles. Therefore, work space is at a premium. 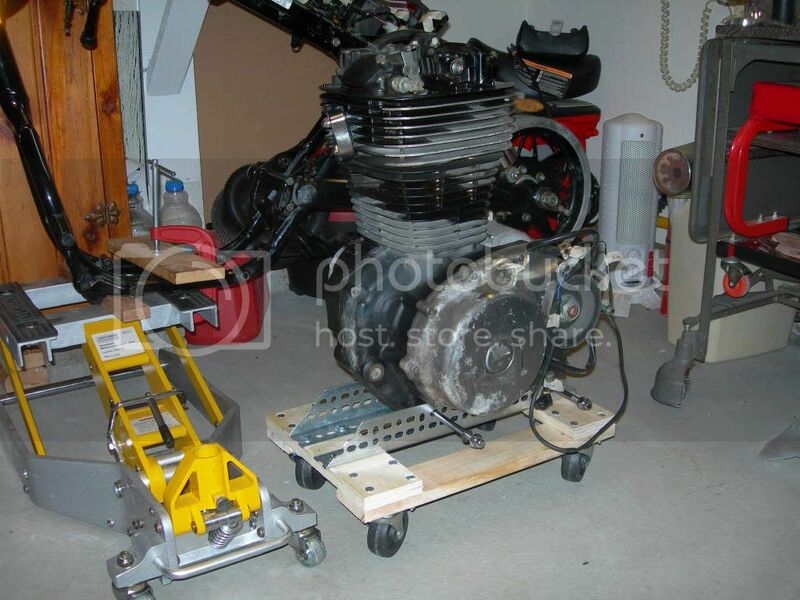 Moving the 110 pound Suzuki Savage engine around to work on it or get it out of the way for other tasks is difficult. The solution to the problem was to fabricate a stand that will firmly hold the engine while being rolled around the garage and also have the stand remain securely in place when I want to work on the engine. 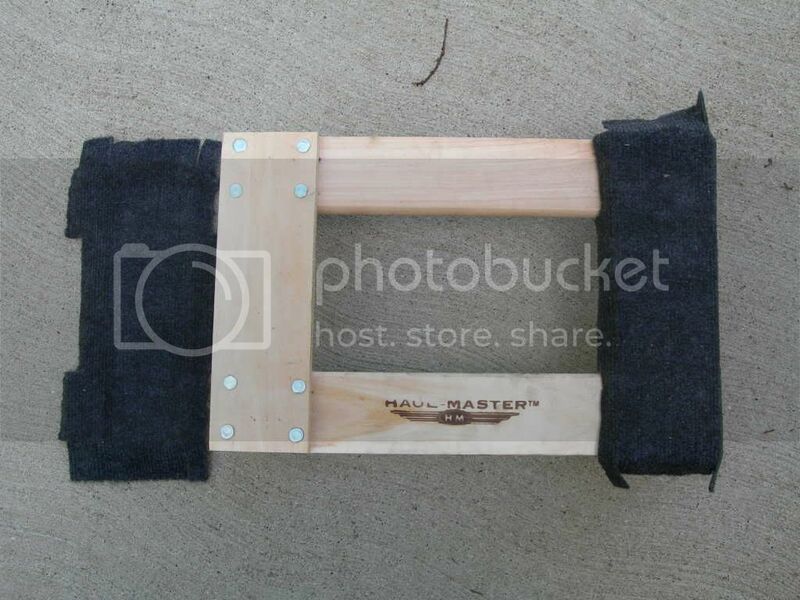 I started by going to Harbor Freight and purchasing a furniture dolly, rated at 300 pound capacity. The cost was $7.99. Then I went to Home Depot and bought several pieces of perforated angle iron, 1 1/2 x 2 3/8 x 36 inch size. I already had on hand the needed assortment of nuts, bolts & washers, wood screws and lumber. Next I gathered the tools that I thought I'd need. There is a fair amount of cutting to be done on the angle iron. It can be done with a hacksaw but a angle grinder makes quick and easy work of it. I used a 4 1/2 inch Porter Cable angle grinder with a .045 thick cut-off wheel. I got both items at Lowe's. Other tools that will be needed are drill motor and drill bits, wrenches, electric saw and tape measure. The furniture dolly had carpeting on the cross members. The carpet needs to be removed. The angle brackets need to be cut to length next. I cut each of the vertical ends at a 45 degree angle. It isn't absolutely necessary to do that. I did it for safety reasons, keeping sharp edges to a minimum. I cut the clearance notches on the brackets next. 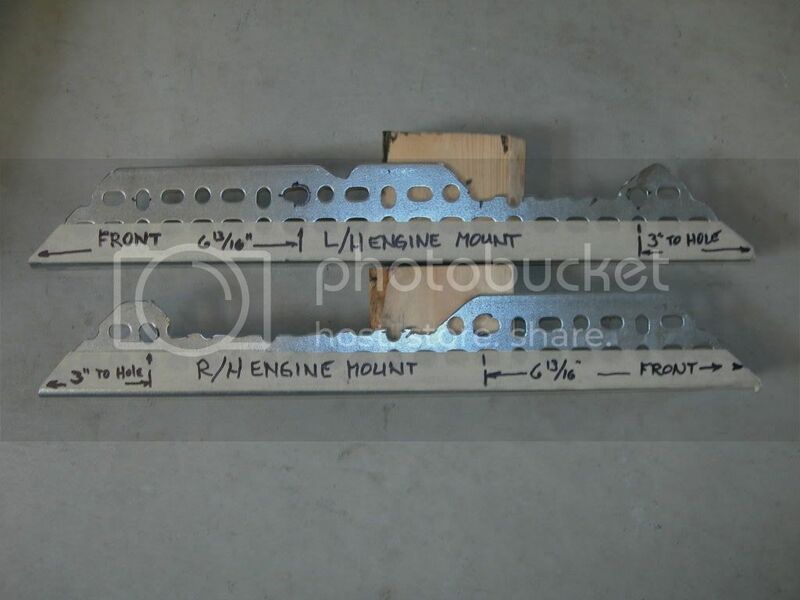 The dimensions for those cuts are shown in the photo's. 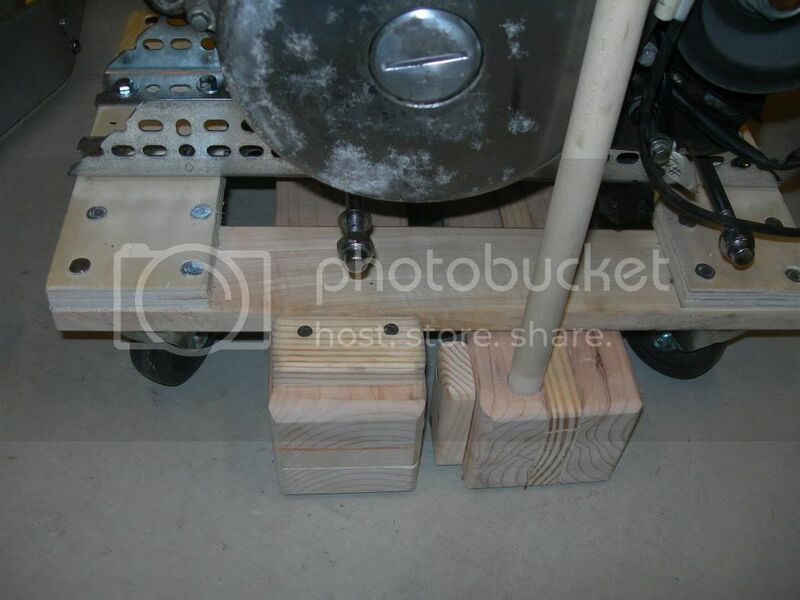 The 3/8 inch motor mount holes were drilled in the brackets at this point. I would have liked them to be 7/16 diameter but my drill motor wouldn't accept a drill that size. I wound up using a round file to open up two of the holes. 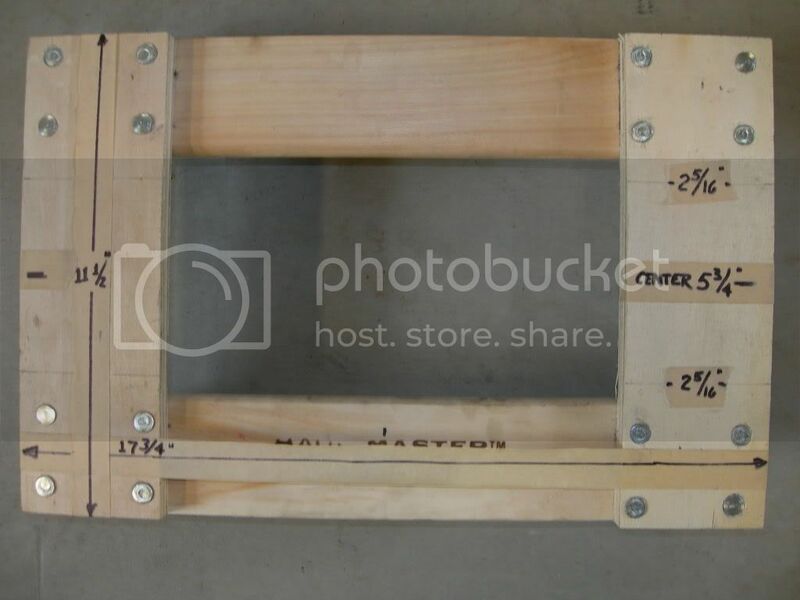 I spaced the two angle brackets as shown on the photo, marked their location and drilled holes through the furniture cart cross member. I bolted the brackets in place using 1/4 - 20 x 1 1/2 bolts. I also added large diameter "fender washers" on the bottom of the cross member for added strength. The stand is now ready to receive the engine. Rather than trying to pick up the engine and position it in the stand, I laid the engine on it's side and held the stand in place while I inserted the engine mounting bolts. With the bolts in place, rotate the engine to the vertical position. The engine is now secured to the stand and can be rolled around as needed. The first half of the project is completed. Now to make the "lifts" that can be used to keep the stand from moving while I'm working on the engine. I want the engine stand to be lifted up on blocks thereby keeping it from rolling when work is to be done on the engine. I measured the height from the floor to the bottom of the stand. It measured 3 5/8 inches, so a 2 x 4 on edge will slide under it. 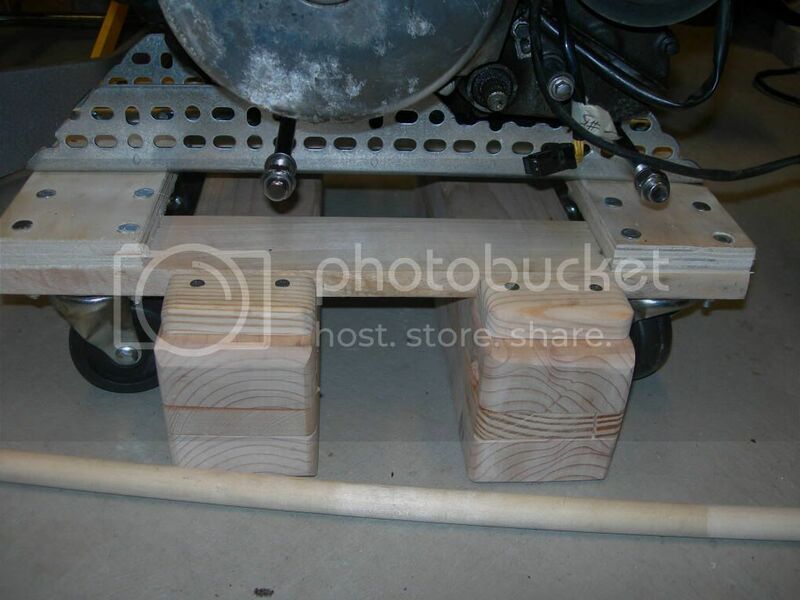 To get the height needed to lift the wheels off the floor would require the thickness of two 2x4's and one 1x4 when the stack is laying flat on the floor. 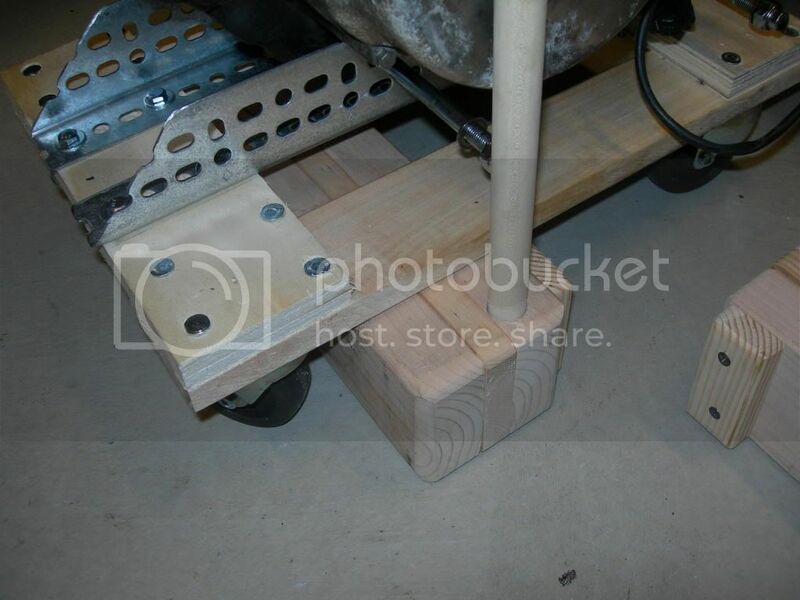 The stack-up of the three pieces of wood lift the stand wheels off the floor by 1/8". After screwing the three pieces of wood together I added two pieces of 1 x 2 inch to the top board. Their purpose is to keep the stand from sliding sideways off the lifting boards. 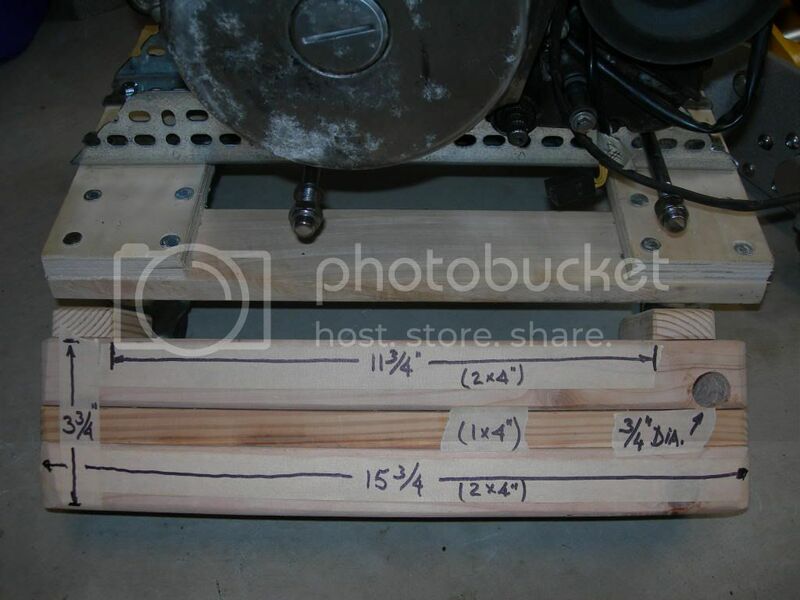 The last step is to drill a 3/4 inch hole through one of the 2x4's. I also cut a piece of 3/4 inch dowel rod to a length of 18 inches. Two of these stacks are needed to lift the stand and keep it secure, so repeat the above steps a second time. 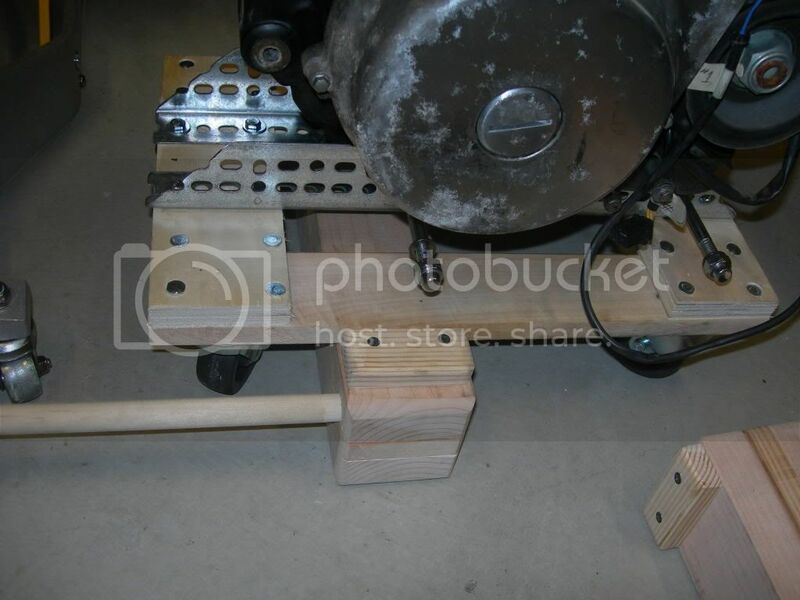 To lift the engine stand off the floor, lay the stack of wood on it's edge and slide it under the stand. Now insert the dowel rod in the hole and rotate it 90 degrees. You've lifted one end of the engine stand off the floor. Slide the second stack under the stand and rotate it 90 degrees also. 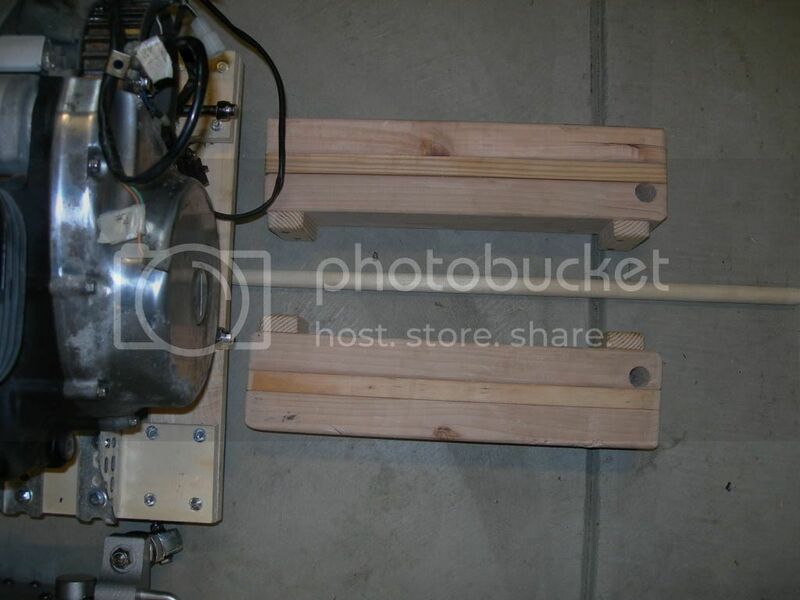 You now have the stand secured so it won't roll and the engine can be worked on without movement. An after-thought...the wood dowel rod works ok, but you have to be careful when using it. It will break if you pull too hard and too fast. I'll probably switch to conduit at some point. Sort of like mine, only better thought out -- and with wheels. Moto...I really like the "parts tray" below your engine stand. I think that'll make a good addition to my moble stand...wonder if the wife will miss that cookie tray?